the Old product (Fig. 354 a). Dress cutting through the waist. Chetyrehchastnaya the lower part, the upper part with zipper on the front. Sleeve vtachnoy. New product (Fig. 354 b). Dress cutting through the waist with a voluminous top. 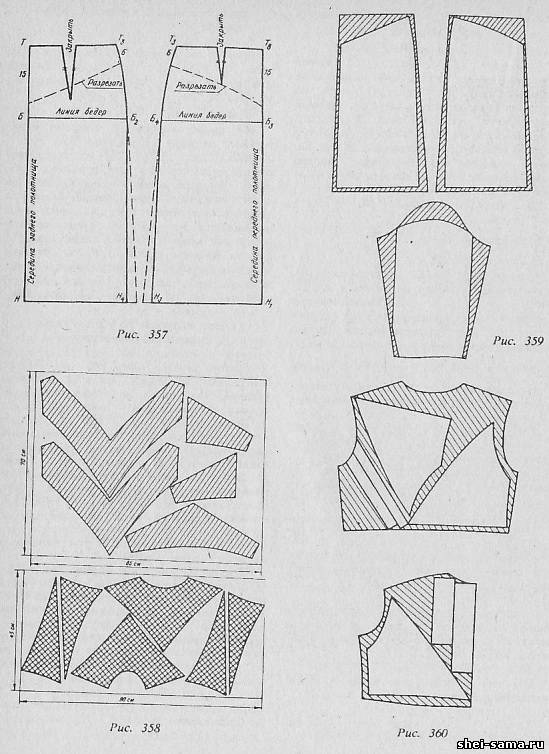 Armhole in-depth slotted. The one-piece sleeve with gusset ensure freedom of movement. Construction drawing design models (Fig. 355). Down from point A0 at equal vertical distances from the highest point of the designed the shoulder seam at the base of the neck to the level of the rear corners of the armpits (ITRS) with the addition of the freedom arm openings (PSPR), and a dot G.
From a point A0 on the vertical hold with a cut equal to the measurement of the length of the back to the waist (DTS) plus the increase in length of the back (Pdts) plus overlap, and put the point T.
From points A0, G, T right are horizontal lines. Right from the point A0 is delayed a period equal to the dimension of poluobhvat chest of the third (Sh) plus the increase in free fit (PG), and put a dot A1. From the point A0 to the right is the period equal to half the measure of the width of the backrest (SHS) plus the raise, and put a dot A1. From the point A1 to the left is the cut, is 22.3 cm, and is preceded by a point A2. From the points a, A2, A1 down are vertical lines. Their intersection with a horizontal line drawn from the points G and T, respectively, are indicated by the points G1, G4, G3, T, T3, T8. From the point T8 in the line of mid front up is delayed a period equal to the length measurement of the front to the waist (RTA) plus increase, plus the overlap, and put a dot A3. From the point A0 to the right and away from the point A3 to the left horizontally is the cut is about 1/3 of poluobhvat neck plus increase, put points A2 and A4. From the point A0 on the line mid-back down is delayed a period equal to 1/3 cut А0А2 and a dot A. From point A2 with a radius equal to the width of the shoulder plus crown landing, is serif. From point T with a radius equal to the height dimension of the shoulder slash (VPC) plus increase, plus the overlap is the tick. At the intersection of the arcs is point P1. From the point G1 is delayed up cut, cut Г1П2 equal to 1/3 plus 2, and a dot P3. From the point G4 up is delayed a period equal to 1/3 cut Г4П4, and put a dot P6. the Point P5 is placed at the intersection of two notches: from point P6 П6П4 radius of the point A4 with a radius equal to the width of the shoulder of the slope. А4П5 = 13,3 cm further deepening the openings Г1Г11 = Г4Г41 = 10 cm From the point P3 to the right draw a horizontal line where the cut is delayed (ПЗП31) is equal to 4 cm. From the point P6 to the left draw a horizontal line where the cut is delayed (П6П61) equal to 3 cm. the line of the armhole of the backrest is made through the points P12, П31, 1, Г22. Line openings, the transmission is made through the points P'51, П61, 2, Г21. Point Г21, Г22 connect point T3. Sleeve (Fig. 356). Are the two mutually perpendicular lines. The point of intersection is denoted by O1. From point O1 up vertically is delayed a period equal to the height of the crown, a dot O2. Cut О1О2 equal to 9 cm From the point O1 to the right and left horizontal segments are deposited, is equal to the half width of the sleeves. Sleeve width equal to the measurement of the arm circumference (Op) plus the increase in free fit. О1Р1 = О1Р2 = 28 cm. О1Р1 and О1Р2 segments are bisected, respectively, are points of RP and RL. Of points RP, RL restored perpendicular. On the perpendicular from the point RP is delayed up period equal to half cut О1О2, and put a dot 1. On the perpendicular from the point RL is delayed a period equal to the interval of RP1 plus 0.5, and a dot P3. the top part of the sleeve is made through the points P2, 9, P3, 5, O2, 4, 1, 8, R1 smooth line. From the point O2 to bottom vertically is postponed sleeve length minus the elongation of the shoulder cut, a dot M.
Through the point M draw a horizontal line on which the point M to the right and left segments are deposited, is equal to half the width of the sleeve at the bottom. the Points P11, P21 are connected by straight lines to points M1, M2. From the points P11, P21 segments are laid down, equal to 21 cm, put the points P12, P22. the Side sections of the sleeve are drawn through the points P2, P22, M2, and P1, P12, M1. The lower section of the sleeve is made through the points M1, M5, M, M6, M2. Model features plotted by the dotted lines in figures 355, 356. Skirt (Fig. 357). For its construction used the design drawing straight skirt: enclosed outlines the main details of the skirt are applied to the hips. The front and rear panels of the skirt hem expand by 2.5 cm the length of the yoke in the middle of the skirt (front and back) is 15 cm on the side of cut - 6 see Tuck closed. 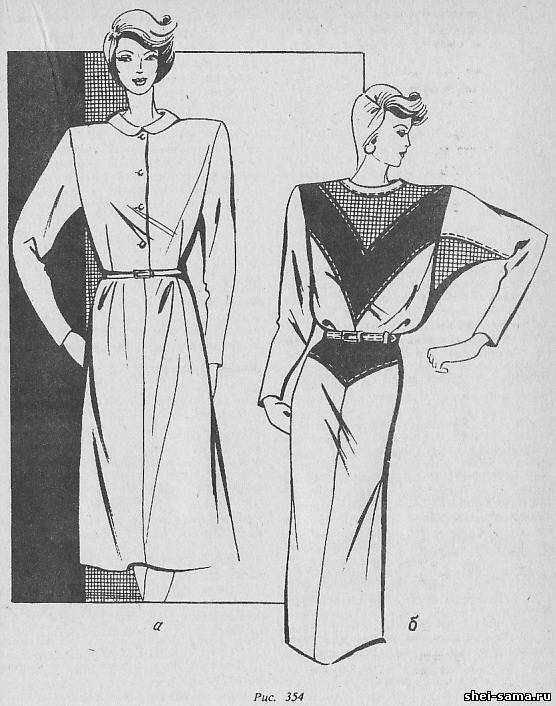 The patterns are cut along the planned lines coquettes. The layout of the parts cut are shown in figures 358, 359, 360.